Brothers In Arms Hell's Highway brings the critically acclaimed squad-based WWII shooter into the next generation of gaming with amazing graphics and sound, new cutting-edge gameplay features and a completely redesigned online component. Delivering on the franchise's compelling story, unrivaled authenticity and intense squad-based action, Brothers In Arms Hell's Highway drops you into Operation Market-Garden, the largest airborne operation of World War II. Lead Matt Baker, Joe Hartsock and the rest of the 101st Airborne Division as they fight to open "Hell's Highway" in a daring bid for a quick end to the war. "With Brothers In Arms Hell's Highway, Gearbox is investing everything to take next-generation gaming to an entirely new level," said Randy Pitchford, president of Gearbox Software. "For Brothers In Arms Hell's Highway, the Unreal Engine 3 powers real next-generation graphics and the most intense, action-oriented recreation of true history ever offered as interactive entertainment." 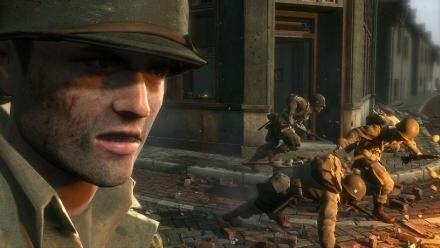 "Since the series was introduced last year, Brothers In Arms has consistently excelled at delivering a new style of tactical shooter wrapped up in an authentic WWII setting," said Francesca Reyes, editor-in-chief at Official Xbox Magazine (OXM). "As fans of the Brothers In Arms series, OXM is incredibly excited to be the first to reveal to readers the world-exclusive first-look at Brothers In Arms Hell's Highway." The issue is available on newsstands since April 11, 2006. Blah, blah, blah. All I heard was WWII, shoot, PS3 and $60.00. Weird.